To answer it is not so simple but nevertheless I will try to do that. Whenever I debate with someone about this subject they always use famous players who have gone down the hill due to a series of injuries. 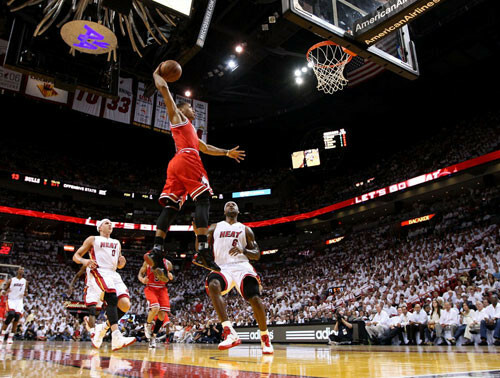 One player that is very famous for that is Derrick Rose for his 40 inch vertical and amazing athleticism. Derrick Rose is a classic example of an amazing player who's suffering heavily from injuries. When he started out in the NBA everybody saw the amazing talent he has and slowly he began making himself a name. Gradually Rose became the leader of the Bulls and the team started climbing back to its glory days. People have started dreaming big with Derrick at hand and there was a notion he’s going to be the successor Michael Jordan. Sadly this didn’t happen as Rose started suffering from injuries on a regular basis. It came to a climax on April 2012 as the Bulls were competing in the first round against the Philadelphia Sixers and Rose tore his ACL on his left knee as he tried to go to the basket. His injury was devastating, it so severe that he couldn’t carry himself of the court on his own and he had to be carried with the help of other people. Since that injury Rose’s career came to a halt, he had to go through a surgery and a long grueling rehab process that made him miss the entire 2012-2013 season, including the playoffs. This saga of injuries kept on going even for the current 2013-2014 season as the long awaited return of Rose to the court was all we wanted to see. Sadly just after 10 games into the season Rose injures his right knee and MRI scans show that he has a tear in the meniscus. As a Bulls fan I was so sad to hear this when it happened, I really felt sorry for him and the team. He had the options to choose whether he wants to do a small surgery that can him quickly back on the court or go through the full surgery that will benefit him better for the long turn so he chose the second option. The price of this is that he’ll miss the entire season and this brings up the question, what is causing all these injuries Rose is having? Does Rose’s vertical leap has some connection with his all his injuries?